Washing laundry should be easy – you put the clothes into the machines dirty and they come out clean. But what can you do when the clothes come out with stains that weren’t there when they went in? 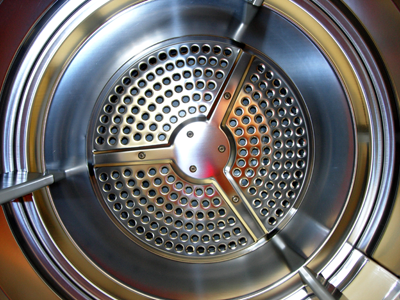 Greasy residue can accumulate inside your washing machine drum from all the laundry you’ve washed – try running a cycle using a cup of white vinegar or bleach or with a product designed for this purpose. Once you do that wipe out the inside and the door seals with a dry cloth and then use a cotton swab to clean the drain holes. Your dryer could be the culprit as well – using hot soapy water and rag, wipe down the interior of your dryer, repeat with clear hot water and then wipe it down with vinegar and water. You wouldn’t want to use bleach to clean the inside of the dryer just in case you missed a spot and left some bleach residue inside. Chipped enamel on the drum could allow rust to form that would cause reddish stains – you’ll either need to replace the drum or have the chipped spots fixed by sanding and painting them with rust-resistant paint. Overloading your washing machine can also cause stains if you use fabric softener because it needs to distribute evenly over your clothes and an overloaded machine can cause the softener to cling to clothes and leave greasy spots.